Fall has officially begun. The air is crisp, leaves are beginning to change color, and everywhere you turn, apple and pumpkin spice culinary choices are at your fingertips. As the season of holiday traditions fast approaches, Bay City Christian School (BCCS) ushers in the beginning of the school year with a sweet tradition of their own. For years, Mary Fleming’s caramel apples were a highly sought after item at the school’s silent auction. Her delicious recipe won over tastebuds of loyal supporters who would bid for an apple each year. The success of Mrs. Fleming’s caramel apples spurred a shift in the fall fundraising efforts for BCCS. 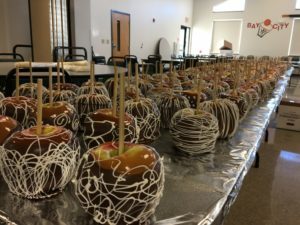 With Mrs. Fleming’s recipe in hand, the school put all their apples in one basket and launched the Gourmet Caramel Apple Sale in 2013, in lieu of the silent action. With 5 years of experience under their belts and 3, 722 apples sold, BCCS is poised to have its largest sale to date. This year 1,700 sweet honey crisp apples have been ordered. Not to mention: 400 lbs of caramel, 300 lbs of milk chocolate, 125 lbs of white chocolate and 100 lbs of nuts! Spread the word and sells some apples, now through Monday, October 15 – Cost is only $10/apple! Help with caramel apple production Thursday, November 1 – Saturday, November 3. You can sign-up to participate here. This year’s funds will go towards providing resources for art electives for the students, as well as supporting the Parent Teacher Fellowship (PTF) which sponsors events that give back to the teachers, students and families of BCCS throughout the year. 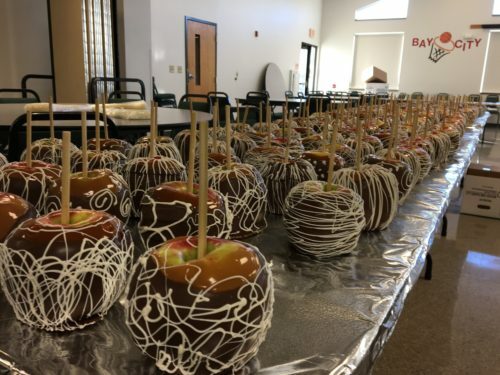 Remember, the sweet treat of the caramel apple itself is just the end product of the time, care and commitment of the students, families, faculty and staff of BCCS. Thank you for partnering with us!